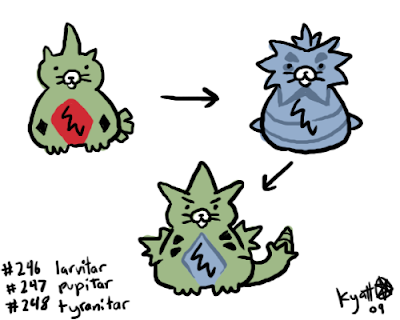 It's somewhat interesting that this Impostor Tyranitar turned out looking nothing like the one I drew for Zeo's 8th anniversary. I wonder if anybody ever caught a Pupitar thinking it was a shiny Metapod, only to be scared half to death when, instead of a sparkling butterfly, a giant hate-filled Godzilla statue came out. I caught a shiny Metapod in white, it is orange.